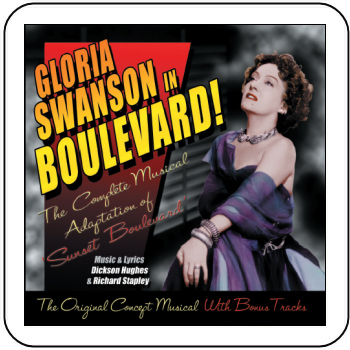 I was delighted to hear that UK record label Stage Door Records is issuing the complete recording of Gloria Swanson's musical 'Boulevard!'. I had the LP that came out in the late 70s which I always found fascinating but was confused at how it suddenly ended. This new release features the unreleased second act! What a treat for us Norma Desmond fans!!! Hopefully Stage Door will treat us to a few sound files soon - can't wait to hear what 'Take A Crack At the Zodiac' sounds like!!! Ive heard that the ending is so melodramatically happy..instead of killing joe she gives joe her blessing to marry betty and the joe and betty live happily ever after. Is this like a Sequel to Sunset Boulevard? Just saw that show in London and it was a total sensations.